WOW! 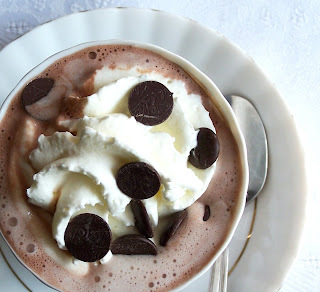 That hot chocolate looks amazing! go to pitango! But then I put that in the comments of the EL post, so you probably already saw it! I think Starbucks uses a mix for their signature hot chocolate, but their original chocolate drink, Chantico (discontinued) might have used chocolate or at least chocolate syrup. I recommend Mayorga Coffee's hot chocolate. SO GOOD! I think they even have a roasted marshmallow flavor. I guess it's not a Baltimore company, but there's a cart at BWI so I'm counting that! Beth - A couple of months ago I went to Pitango and was so tempted to order the hot chocolate, but I had come specifically for gelato, so I ended up choosing that. The whole time I had the dessert, I knew I made the wrong choice. Your comment confirms it! Looks like I'll have to go back soon and make the right choice this time! Melanie - Oh I love Mayorga in Silver Spring! I'm so excited you told me about their Hot Chocolate because I actually always get their coffee when I wait at the Southwest terminal, now I can try something different on their menu! Yay!! !